I received free product in exchange for an honest product review. I was not paid for this review and all opinions are my own. I am a Purex Insider and I am thrilled I was accepted for this promotion. I love the smell of clean laundry. If there was a perfume or body spray that smelled like freshly washed clothes, I would probably buy it. I use fabric softener sheets for so much more then my laundry to repel lint and reduce static cling. I have three cats and a dog that shed like crazy. Did you know that fabric softener sheets repel pet hair? They work great. I run a sheet across my tv screen and computer monitors and it helps keep the hair and dust off of them. Which is great because that means I don’t have to clean them as often. It also works great on floor boards. If you’re like me, those are easily over looked during cleaning day and seldom cleaned. I place fabric softener sheets in my pillow cases too. I love the smell and it brings on a calming sensation. place one in your purse, gym bag or suitcase. Do you use them for anything else, if so I would love to hear what you use them for?? You can find Purex Fabric Softener Sheets at your local Wal Mart. 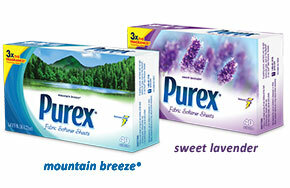 You can find Purex on facebook and pinterest. Disclaimer: This giveaway is not associated, sponsored nor endorsed by Facebook or Twitter or any other social networking site. Please Note: Winner will have 24 hours to respond in order to claim the prize. A second chance drawing will be held in the event the first winner doesn’t respond. I am disclosing this in accordance with the Federal Trade Commissions 16 CFR, Part 255 Guides Concerning the Use of Endorsements and Testimonials In Advertising. I have used them all the ways mentioned in the review and then I save all the used ones for great dust cloths. I normally just use my dryer sheets for drying my clothes but I am interest in trying them for other methods. I use them in my dryer and also to dust my baseboards. I use them in the dryer with every load.